Joey Taylor’s childhood went awry somewhere. Now that she’s alone, fourteen years old, her father dead, her mother gone adventuring, she sees the opportunity to bring herself up right. But just as she’s getting started, Joey meets David Giffard, an eccentric loner whose mysterious habits draw her into his own strange and solitary life. Giffard gives her piano lessons and then begins to show her bits and pieces of a film that seems to hold a lesson, too, if she could just make sense of it. When at last she to learn the secret of this odd home movie, Joey sets off for Los Angeles to find the actor whose role in the film is somehow crucial to Giffard’s story–and, now, to her own. Along the way her path crosses those of a male stripper who wants no trouble, a dancer who wants to disappear, a philosophical truck driver who wants to settle down, and finally the hapless actor who bitterly wants out of the movie of Giffard’s life. Joey’s search involves them all in a story where certain knowledge surprises, recognition looks strange, and the only way to come home is to keep moving. Beauty Skinner is, as she herself admits, a woman to whom small men have never been indifferent, that most unfortunate of females, a “big girl.” Beauty is fated to be the subject of unbelieving stares, to stop conversations, and to realize with every lumbering step that towering ungainliness is the inescapable fact of her life. 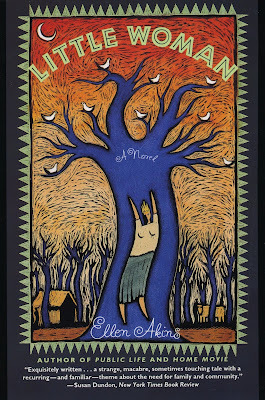 But in Ellen Akins’s fierce comedy Little Woman, escape is precisely what Beauty manages. After almost accidentally killing her twin sons (the product of a peculiar marriage into which she has stumbled), Beauty decides to head for greener pastures alone. Her cunning plan: to set up a rural shelter where needy women can be rehabilitated, a shelter that is designed to fail quickly, leaving Beauty a cozy retreat of her own. Her willing tool: the guileless philanthropist-heiress Clara Bow Cole, who is all too pleased to apply her wealth to this altruistic adventure. A plot of land and a house are secured, a group of down-and-out women is solicited, and Clara Bow and Beauty depart for the wilds of Wisconsin to await their charges. What arrives, however, are hardly the wretched souls that Beauty has anticipated. Molly, Kathy, Gigi, Lynn, Cathy, Elizabeth, Cora, Joan, Barbie, and Mary Belinda are, in fact, a ferocious and intractable crew. Thieves, drunkards, and runaways, they greet their new life with a raunchy stubbornness that leaves Beauty nonplussed as she becomes determined to make her bogus venture work. She insists that her diffident charges eke an existence out of the wilderness, a task that turns their colony into something like Robinson Crusoe’s island in a bad year, and its occupants a distaff counterpart of Lord of the Flies. 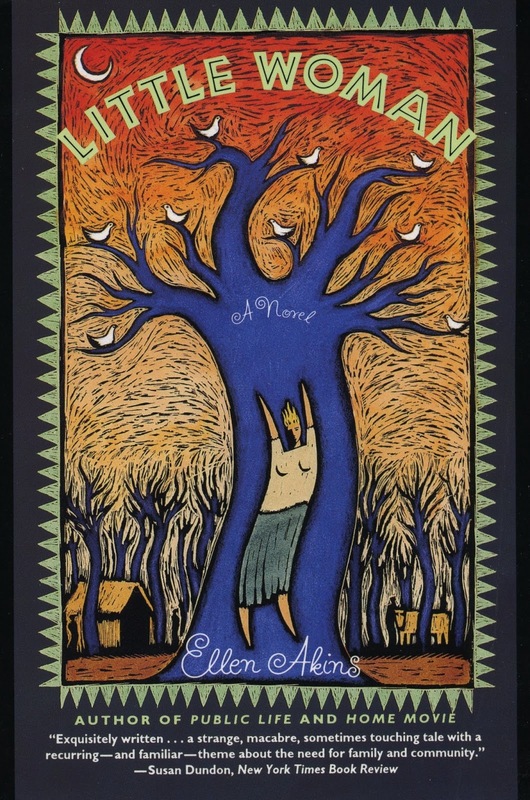 While its heroines’ battles to survive nature–and one another–have hilarious (and ultimately tragic) consequences, Little Woman takes an unsparing look at the struggle to form families and communities, and how people’s need for control renders any sort of bond between them suspicious. For Ann Matter–once a daringly original filmmaker, now an improbably successful director of commercials–the invitation was extraordinary. Governor Henry Anderson needed a media adviser in his campaign for the presidency; would she accept the job? Though she has had little experience, or interest, in politics, the challenge proves irresistible–to take an unpolished but charismatic politician and remake him, marketing him to the American people as the incarnation of their most cherished ideals. 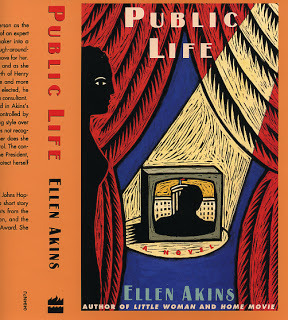 Ellen Akins’s third novel, Public Life, is an exploration of how images have come to rule our lives, from the highest levels of government to the edgy accommodations of sexual politics. Akins’s world is one saturated with print and pictures, where power is a function of how skillfully one manipulates the media. It is a world in which Ann Matter moves all too confidently, only dimly aware of its seductions. Under her guidance, Anderson is victorious in his presidential bid, and Ann is rewarded with a position on his personal staff, responsible now for preserving the image she so brilliantly created. That image proves so compelling that Ann herself is won over by it, unwittingly setting illusion and reality on a collision course. As Ann’s own precarious equilibrium is undermined by the persistent incursions of her past, Anderson’s presidency is propelled into a series of scandals thta expose the hollowness at its core. 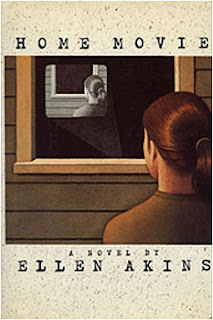 In Public Life Ellen Akins has written one of the most searching and original political novels in years, a book as remarkable in its relevance as in its imaginative power. A rich novel of family rivalries, corporate maneuvers, and sexual intrigue–set in a small Wisconsin beer town. In the background: a small, family-run brewery, Gutenbier, whose backward business practices have been miraculously transformed into an asset by the new vogue for microbreweries and designer beverages. At the center: two women whose world is the brewery: Melissa Johnson, is the heiress to Gutenbier, and Alice Reinhart works there. On her father’s death, Melissa inherits the chairmanship everyone expected to go to her brother and finds herself resented by both workers and management. Alice, returning from New York and a bad marriage, takes up her job in the brewery only to discover that an indiscretion she committed at seventeen has surfaced and has made her the object of a series of seemingly innocent pranks that slowly reveal a darker intent. As these two women fight the forces arrayed against them and the novel moves toward its climax, the business, the politics–the life–of a small town are compellingly portrayed.